Happy Easter! The market has opened a little late today because we’ve been spending time with our families. We hope you have enjoyed the holiday weekend as well! This week’s preassembled CSA bag will contain Spring Mix, Oak Leaf Head Lettuce, Fennel, Kale, Basil, Radishes and Kale Raab. This past week has been a huge week on the farm, and we are proud of our entire team for being both dedicated and diligent in working to beat the rain. Amidst drizzle Thursday, Eric and Patrick transplanted over 3000 of our outdoor spring brassicas while Angela and Caroline harvested, prepped, and packed your CSA orders. On Friday, the first rotation of cucumbers went into the greenhouse, and they are some of the healthiest we have ever transplanted. We are so excited to be bringing you the fruits of these efforts. An interesting and unique item that we’d like to highlight this week is our kale “rapini.” As our winter kale rotation nears the end of its cycle, it has begun producing flower buds. These flower buds are a rare treat; they are mild and tender tasting like a cross between kale and broccoli. The kale rapini is high in Vitamins A and C and will make a healthy addition to green smoothies or stir fries. It can be used in any recipes that call for rapini or broccoli-rabe. We hope you enjoy the opportunity to try this unique vegetable unknown to grocery-store shelves. As always, thank you for your support of our local farm. Winnsboro, TX: Please read - changes coming! The market is now open. This will be the last week of Thursday pick-ups. Beginning next week, the online market will be open an extra day but you must pick up orders on Saturday mornings at our downtown “live” market, 8-10 am. You will still have the benefit of pre-ordering & selecting some products which aren’t typically available on Saturday, but also the opportunity to browse our other market products while picking up. Thank you for your continued support of local producers! Middle Tennessee Locally Grown: Finally: Some News! If you don’t see a map, click on the address link. Welcome to Middle Tennessee Locally Grown online farmers’ market! As always, everything you see on our website is the “cream of the crop” from local farmers, the best products picked and made with pride especially for YOU! When you place an order with our farms, you know you are supporting your friends and neighbors, located in Middle Tennessee. Don’t forget about our pick-up location in Tullahoma in addition to the usual one in Manchester. Now you can avoid the delivery charge and come visit with your market managers! Be sure to let us know via the drop-down menu which location you prefer for pickup. (L to R, top) Arugula “Sylvetta”; Baby Lettuce Mix. (L to R, bottom) Baby Spinach. (L to R) Asparagus and Lettuce “Trust Your Farmer”. It’s tomato and pepper plant time at Dogwood Valley Greenhouse! We’re officially past our “average date of last frost,” April 22. It’s been basically an “early spring,” which to me means the ground may be warmer than usual. So I think it will be safe to plant tomatoes and peppers by May 1, and the ground should be warm enough then to encourage growth. I would suggest purchasing your tomato plants this week and keeping them in the pots, in or near your garden area, for another week so that you can bring them inside if we hit another cold night. Heirloom tomato varieties I have this year are: Brandywine, Supersweet 100 Cherry, Mortgage Lifter, Mr. Stripey, Rutgers, and Beefmaster. Pepper varieties are: Purple Beauty, Sweet Banana, and California Wonder. I’ve also updated quantities and availability on all the perennials, herbs, and hanging baskets. You will notice several newly available now, and a couple of new-to-market additions within a week or so. (L to R, bottom) Herb Plants in Embellished Terracotta Pots; Easter Egg Planter. Thursday afternoon between 4:00 p.m. and 5:30 p.m.* under the big pavilion on Fort Street with signs that say “Coffee County Farmers Market.” It’s behind the Farm Bureau building on Main Street, and across the street from the Manchester City Schools administration building, 215 East Fort St, Manchester. Or on Fridays between 4:00 p.m. and 5:00 p.m. inside “Nature’s Elite”, next to Dunham’s Sporting Goods, in the Cherokee Square Shopping Center on North Jackson Street in Tullahoma. We can also deliver your order to your home (or other location) on FRIDAY afternoon for a small fee, if it’s more convenient for you. If you prefer to utilize this service, please place an order for it, same as other products, selecting your delivery area. Don’t forget to give us your location address in the comments section of the order. Also please text Linda at (931) 273-9708 for specific arrangements. We thank you for your interest and support of our efforts to bring you the healthiest, the freshest and the most delicious locally-produced foods possible. Please encourage our local farmers by helping to spread the word about our wonderful market to everyone you know. We offer a great variety of local farm products, and our items will be in your hands in time to plan for the weekend. Wonderful local products are available for ordering from the comfort of your own computer. More new farmers are considering joining our market, if they can expect enough sales to help pay their transportation costs. Please help us grow the market by sharing this e-mail with your friends and inviting them to give us a try. And if you haven’t ordered from Manchester Locally Grown for a while, please check out our wide variety of offerings this week. Also please let us know if we can improve our selection or scheduling in any way to better suit your needs. Here is the complete list for this week. Four Seasons Farmers Market: April 21st market open! The market is now open – please browse and support your local farmers! Lots of spring greens and salad mixes, olives, plants and cut flowers are available. Check it out! Orders must be placed by noon on Tuesday. On Thursdays: Here’s a map. I got to spend some quality time out in the garden today. We’ve established a lovely Easter tradition here where my daughters take turns hiding eggs for each other around the yard and garden while I watch from a comfy hammock. Before we could do that, though, I had to tame the jungle the yard had become, including the parts of the garden I hadn’t planted in yet. A few years ago I moved to this rental house on the west side of town, and I was lucky enough to find a place with raised beds already established in the back yard. They were overgrown and there wasn’t an easy way to get water out to them, but just having them there was a great start. Even if the beds weren’t here, I could have a little container garden on the patio, which is an easy way to grow a surprisingly large amount of veggies when you don’t have any land to grow in. But if you don’t have space of your own for a garden in the ground and growing in pots doesn’t sound like a “real” garden to you, you’ve got another option: community gardens. There are a number of community gardens around town, though I suspect some have fallen into disuse. Like any project that runs on volunteers, the amount of gardening getting done will ebb and flow with the hands available. If you’d like to get involved in bringing and maintaining public gardens for Athens communities, I’m sure the Athens Land Trust and the Community Garden Network would love to hear from you. They have a website where you can find out more: http://www.athenslandtrust.org/community-agriculture/community-garden-network. They have descriptions and other information about some of their current active gardens, and I’m sure they’d love more hands. Thank you so much for your support of Athens Locally Grown, all of our growers, local food, and our rights to eat it. You all are part of what makes Athens such a great area in which to live. We’ll see you on Thursday at Ben’s Bikes at the corner of Pope and Broad Streets from 4:30 to 8pm! The many other area markets are starting to return! The Athens Farmers Market is open on Saturdays at Bishop Park, and Wednesday evenings downtown at Creature Comforts. You can catch the news on their website. The West Broad Farmers Market is closed for the season, and you can watch for their return here: http://www.athenslandtrust.org/west-broad-farmers-market/. The Comer Farmers’ Market is open on Saturday mornings from 9am to noon. Check www.facebook.com/comerfm for more information. Washington, GA also has a lovely little Saturday market, running on winter hours now on Saturdays from 1-4pm. Folks to the east can check out the Hartwell Farmers Market, which starts bright and early on Saturday morning from 7am to noon, and Tuesday afternoons from noon to 4pm. You can learn all about them here: www.washingtonfarmersmkt.com. If you know of any other area markets operating, please let me know. All of these other markets are separate from ALG (including the Athens Farmers Market) but many growers sell at multiple markets. Please support your local farmers and food producers, where ever you’re able to do so! We thank you for your interest and support of our efforts to bring you the healthiest, the freshest, and the most delicious locally-produced foods possible! We hope you all have had a nice weekend and a Happy Easter. Ordering is now open on the market. Check out My Daily Bread’s new Lemon Thyme Shortbread cookies along with all the other wonderful things on the market. Since we are still short on veggies, we are taking this week off from deliveries. Starting with the May 1st delivery, we intend to go every week until my vacation, Thanksgiving week. I hesitate to speculate what we will have next Sunday. I don’t want to jinx it, but we should have some good stuff. If you need to text me, my number is 615-838-0428. Foothills Market: The Market is Open! Foothills Market is open for one last week before the Clarksville-Johnson County Community Market starts up downtown on May 4. We have the usual selection of meats, eggs, and fresh greens for salads and sides. Shop the market between now and Wednesday at 5 p.m., make your selections, and click the “Place your order” button. We’ll have your order ready for pick-up on Thursday afternoon. Just to repeat – this will be the last week for ordering through Foothills Market until September when the in-person market closes. Eat something fresh this week! Yalaha, FL: Kale still on sale but the season will soon end. Order now through 5 pm Thursday April 25th for Saturday April 27th Pickup, (or contact me if you want a different day, we do have some flexibility.) Again this week Friday may be best or early Sat Morning. Remember to tell me when you want to pick up! Calendula flowers are available (let me know if I should add them to the market) Eddible and/or medicinal. I haven’t done pictures to make the listing but they are Bright Orange. Let me know if you are interested in getting fresh cultures for Kombucha, Milk Kefir, or Water Kefir. My Kefir grains especially have been growing fast. The Kombucha scoby is a little slower about it. Also, if you want me to list super foods like Purslane, let me know, I have it volunteering wild here and I also have nettles this season. If you have any particular requests, let me know I’m happy to grow to order. You have to sign in to see the add to cart button. Then set the number and click the add to cart button on the items you want to buy (it is the little picture right next to the quantity box.) Remember you need to check out before your order will be placed. 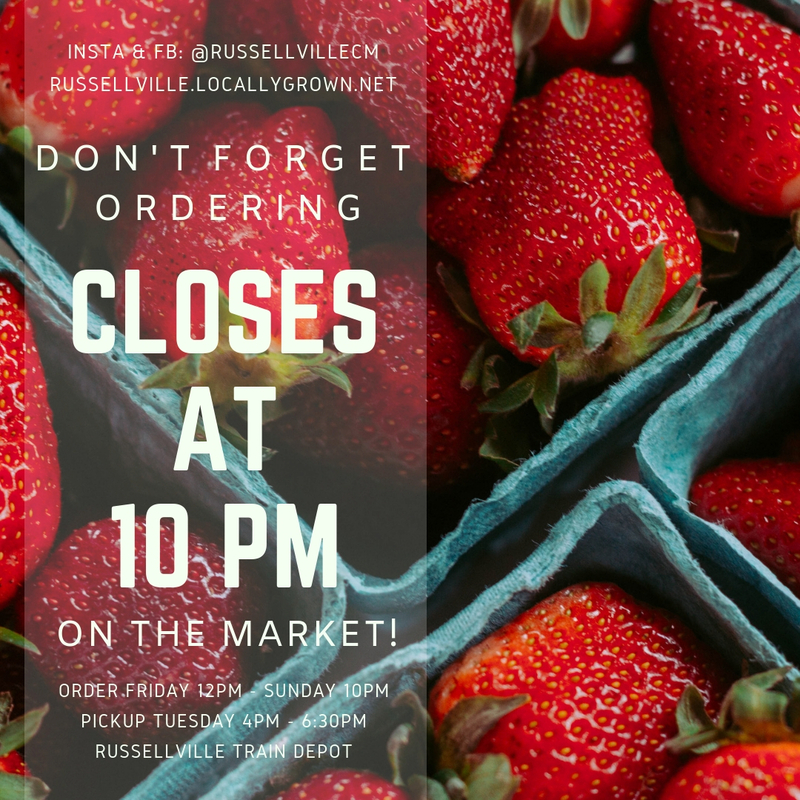 Russellville Community Market: Ordering Closes at 10PM on the Market! Ordering on the Market Closes at 10PM! We have fresh strawberries, baby radishes, a variety bouquet of jonquils, daffodils, and narcissus, Retro Roast Coffee, free range eggs, grass fed beef, kale, beeswax lotion bars, dog treats, and tons of other goodies on the market this week. Green Acres Atkins Strawberries photographed above.